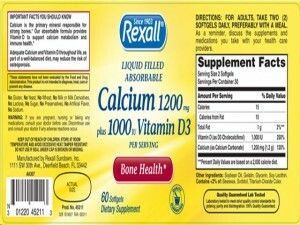 Florida-based company Today Rexall, Incorporated has issued a product recall on one of its supplement products, the “Rexall Calcium 1200 mg Plus 1000 IU Vitamin D3 60 soft gels.” The product is being recalled because it contains an undeclared allergen. The product was distributed exclusively at Dollar General stores (which has a total of 9,800 branches in 38 states). The company emphasizes that only one lot of the product is affected by the recall. As soon as the problem was discovered, Rexall immediately announced a recall to prevent the product from causing harm to the public. The recalled supplement is said to contain glucosamine, a chemical derived from the shell of crustaceans. Because the product might contain trace amounts of shellfish that have not been declared on the product’s label, it is possible that the supplement can trigger allergy attacks to people who are allergic to shellfish. Shellfish includes shrimp, lobster, oysters, crab, clams, or a combination. Common symptoms of an allergy attack include high fever, itching, rashes and hives. In some cases, allergy attacks can become more serious, which might even lead to death. To date, no medical emergencies or allergy attacks related to the recalled supplement product has been reported. Consumers who have questions about the product or the recall may return it to any Dollar General store in order to be given complete refund.